There are birding terms to learn too? A term I’ve recently been introduced to is the ‘giss’ of a bird. It’s used to describe the general impression of an individual, given its behaviour, size and shape. The stonechat for example has a similar ‘giss’ to the Dartford warbler. Both are skittish, robin-sized birds that love to perch on top of gorse bushes, but I’ve surprised myself by how easily I’ve been able to identify the stonechat from a distance, purely based on its behaviour. However, I still manage to confuse it with the Dartford warbler, and I’m sure that once our summer migrants arrive there will be a lot more confusion at my end! The stonechat is an excellent bird to identify. I’m normally drawn to its location by the very distinctive, signature call – one of two stones being knocked together (fitting name, right!). I haven’t heard anything similar to it on the heath, but the call actually sounds more like that of an insect! Its song is one that I’ve really struggled to pick up, but keep an ear out for any short chattery bursts that sound like they’re coming from just above the heather. Once perched, you should easily be able to tell whether it’s a male or female, dependent on the colour of the head. The key physical trait to look out for is the white collar, it’s present on both sexes, but far more distinct on the male due to its contrast with the deep black head. 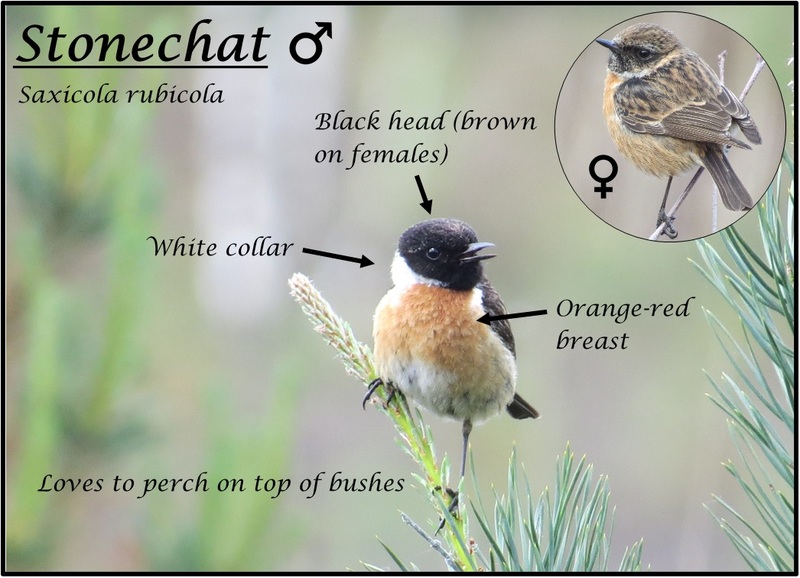 I’ve very frequently found both male and female stonechats in close proximity, calling out to one another. Next time you’re out on the heath, keep an ear out for the sound of stones clacking together and if you do see a small, twitchy bird fluttering above the heather – you may well be in luck for a stonechat. In the next entry, I’ll be talking about a first for me and, thanks to the rest of the team, a bird that I’ve learned a lot about – the crossbill.